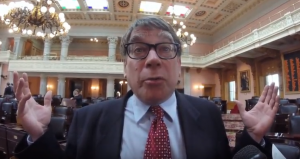 Today, we’re publishing a searchable log of office phone calls by powerful Ohio House Majority Leader Bill Seitz. Analysis of the call log provides new insights into his contacts with influential energy lobbyists in the state capital of Columbus. Since January, we’ve been asking why the self-styled “free market” Seitz has worked so aggressively to bailout uncompetitive Ohio coal plants, while blocking the growth of the wind industry and thousands of Ohio jobs. We’ve also been looking into ethical issues stemming from his remarks viewed by many as demeaning to women. But despite this statement, the Seitz phone log reveals that when it comes to energy, his top phone buddies are lobbyists representing major industrial users of natural gas in Ohio, and Chevron, the second largest producer of Utica shale oil and gas in the state. To understand these calls, we converted a phone log provided in response to our Dec. 22, 2017, records request, into an Excel spreadsheet. We then searched open source records including Google, LexisNexis and Spokeo to determine the owners of phone numbers with whom Seitz exchanged phone calls. The phone log covers 11 weeks from Nov. 11, 2017 through Jan. 4, 2018, when 403 phone calls from 192 different telephone numbers were sent or received by Seitz’s legislative office phone line. We asked for 57 weeks of logs — twice — but were told technical shortcomings made hat impossible. Click here for a list of the names Seitz exchanged calls with, including those that we’ve identified to date. Click here to find the entire searchable log. Can You Identify Unidentified Numbers? We are asking readers for help in identifying other unknown numbers from the Seitz phone log. If you can help or if we’ve identified someone in error, please let us know by sending us a confidential tip. Just click here or on the button at the top of our website. The odds are strong that the calls were taken or made by either Seitz and former Legislative Assistant Jimmy Wolfe, the two who worked from Seitz’s office on a regular basis. The call log reveals that the two lobbyists Seitz exchanged calls with most frequently during this 11-week snapshot represent energy interests in Ohio. Seitz’s office exchanged seven phone calls with the lobbying firm of Denise “Denny” Larr, of Larr Policy Consulting. Five of the calls took place on November 30, 2017. During the period that Seitz was talking with Larr, she was lobbying about three wind turbine setbacks setback bills, a revision of energy efficiency, “recovery of national security generation resource costs,” and utility refunds for the Ohio Energy Group. Larr’s other major energy client is Interstate Gas Supply, Inc. (dba IGS Energy), a private, independent natural gas and electric supplier based in Dublin, Ohio, that serves more than 1,000,000 residential, commercial and industrial customers in Ohio and ten other states. Revenues in 2016 were $1.1 billion. During the period that Seitz exchanged calls with Larr, she was lobbying about many of the same issues for IGS Energy: revision of energy efficiency, wind turbine setbacks, etc. If you want to talk to Chevron in Ohio, you talk to lobbyists William L Byers, IV, Andrew Minton and their two associates. They are Chevron’s sole registered lobbyists in the state. Chevron is a significant producer of Utica Shale oil and gas in Ohio, with approximately 309,000 net acres, according to a 2017 company fact sheet. Another industry analyst called Chevron the “second largest lease holder” in the state in Dec. 2014. Missing in the Seitz phone log are a record of calls exchanged with Sam (“The Randazzler”) Randazzo of the firm McNess Wallace & Nurick LLC and self-described “chief guide on Ohio utility legislation and counsel to the Industrial Energy Users-Ohio.” As we have seen, Seitz depends upon Randazzo, as when he supplied — at Seitz’s request — eight critiques of a Senate amendment to reform the wind setback law. How Seitz may have been communicating with Randazzo is a question worth pursuing.